Visual cell counter for use with microscopy images and more. Is there a better alternative to Cell Tally? Is Cell Tally really the best app in Medical category? Will Cell Tally work good on macOS 10.13.4? Cell Tally needs a review. Be the first to review this app and get the discussion started! Cell Tally needs a rating. Be the first to rate this app and get the discussion started! Click cells to draw sequentially numbered markers belonging to user created categories, where name, shape and colour can be defined. Markers and categories are unlimited and fully editable. Delete, go to, rename, and more. Save your work and come back to it later, or share it between computers. Export your data, or your annotated images. Annotate your work with notes and divider bars, use the measurement tool and ruler bars to cordon off sections for analysis. User friendly: an intuitive interface controllable by mouse or keyboard allows you to work efficiently. A navigator window helps you track your position, and allows you to jump to anywhere with a click. 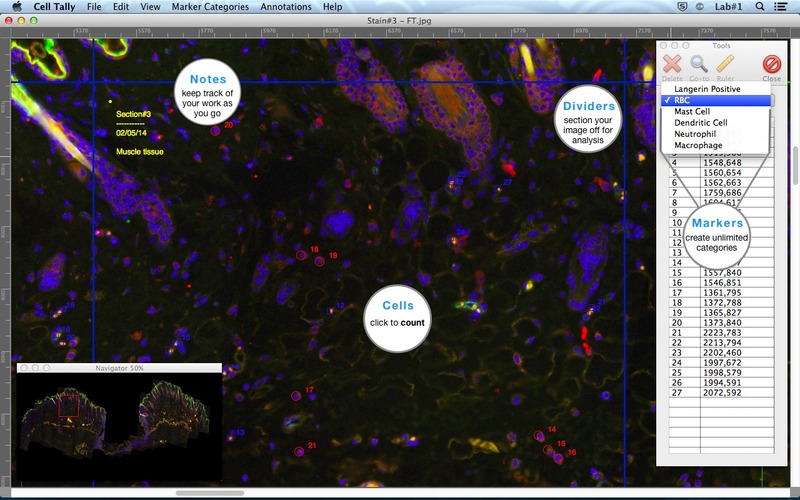 Optimized to support large resolution images (28000x7000 and greater) common to microscopy. Your computer's hardware is the limit. Cell Tally is the only stand-alone software dedicated to manual cell counting. Replace or avoid old, slow, multi-step techniques or bare-bone plugins. Increase your productivity, reduce time and stress spent counting, and generate the results you need.